Bogmærker er lette at lave og en fin lille ting at gi' væk. Dette er lavet med et stempel fra Sugar Nellie, 'Winking Student'. Hun er da et perfekt motiv til en bog. fået til at bruge af de grønne ark og ikke de lilla. er havnet langt nede i Maja Design bunken. Hjerteborden er lavet med en die fra Magnolia. og selvfølgelig mit 'lavet af' stempel. Hvis du ikke har læst denne bog, så vil jeg anbefale dig at gøre det. Og når du er færdig fortsætter du med 'Potensgiverne'. Sugar & Spice. DT card for HMFMC. I am going to be a grandma again VERY soon...and it's a GIRL! precious little girl in your life. A second winner will recive a prize from My creative Classroom. One Free Class of Your Choice. A third winner will get a $10 gift package prize from Pizzazz Aplenty. so jump to the HM&F Monday Challenge to see them. 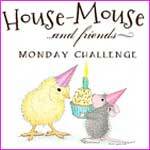 Official House-Mouse Designs site found HERE! 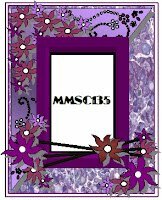 Just look for this "HMD By Me Gallery"
link on the website's sidebar and follow the steps for adding your work! Today I have made an easel card for a baby girl. 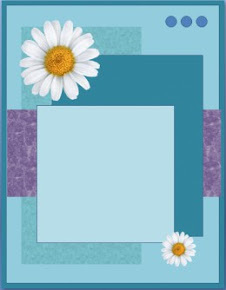 I love making folded cards, and easel cards are a favorite of mine. 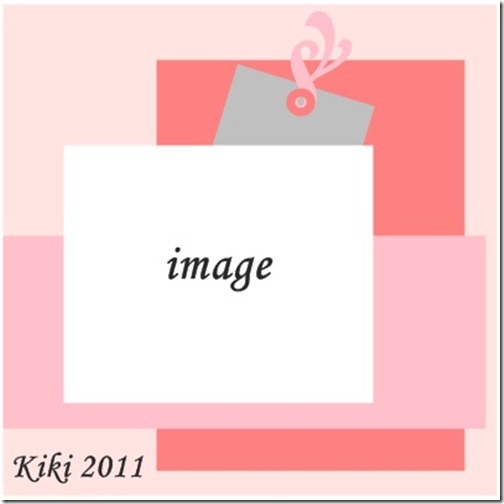 I have used this-for me -new adorable image ' Special Delivery'. The girlie papers are 'Little Sprout' from Fancy Pants. A better photo to show you the easel card. where the bird was out of the frame. It looked so great I had to copy the idea. a nose so sweet and skin so soft'. The text on the tag is so true, so true! It is copyed from the Fancy Pant's papers. and added to the ribbon on the tag. On the back side I found a place for my personal stamp. A Sketch, DT card for Fairy Fun Friday! this fabolous sketch for you to follow. Well, we are dying to see your creations. the inspirational cards from my talented teemies. 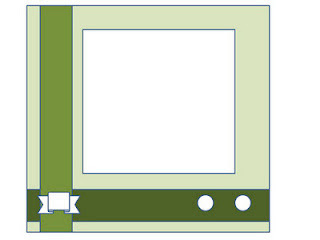 I have used 'Mistletoe Kisses' from the Prairie Fairy Designs for my card. She's a dream to colour. The design papers are 'Snowfall' from Bo Bunny. They are really glittery and lovely. Blue and brown is a beautiful colour combination. The snowflake is made with a die from Marianne Design. I almost use it on every Christmas card I make! Well what can I say here? Nothing new, really. My usual back side with my usual personal stamp.
.:A Sketch, DT card for DDCC:. Today DDCC have a sketch for you. I'm not sure about you, but I love following a sketch! Take a look at this one, you just feel like creating don't you? The sponsor for this challenge is Sassy Studio Designs. They have kindly donated four digistamps to a lucky winner. of all the beautiful cards my teamies has created. For my card I have used this wonderful Tilda with a butterfly. it was a dream to make this card. Can you feel the sun?? and they don't have a 'name'! Pearls, pearl string and flowers are from Kort og Godt Hobby. and I've added a lot of Stickles onto them. The back side, with my personal stamp! D for Distressing, DT card for ABC Christmas Challenge. Hi out there in Blogland! the new challenge at ABC Christmas Challenge. D for Distress It ! Sweet Stamps manufactures artistic rubber stamps on cling cushion for use with acrylic blocks. We carry a variety of stamping and paper crafting goodies like our own Shades dye inks, metal embossing plates, embossing folders, cutting & embossing dies (Cheery Lynn, Marianne, Joy! and Nellie's), fine detail embossing powders, specialty cardstock and vellum along with supplies for parchment crafting. 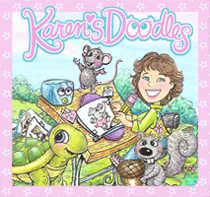 and our winner will receive 3 digis from Karen's doodles of their choice. We enjoy visiting you all to see your beautiful creations. or picked for the top 3 list. For my card I've used 'Skating Pair' an image from Karen's Doodles. The team was kindly given some images to use for this callenge. and in some glittering paper. Like the front.... as always! Midway reminder for the 'Make Wishes Come Trough' challenge at HMFMC. lovely mousey sisters, please take a look here. Today I want to share a 'Get Well Soon' card with you. The papers are from Basic Grey, 'Lime Rickey'. Lovely papers with a lot of bright colours. I'm sorry but I can't remember from where. together with my 'Made by Dorte' stamp. Det regner her og jeg har jobbe week-end. og lave et kort med så flotte farver som disse? Jeg har brugt et stempel fra Sugar Nellie, 'Luv A Latte'. Det kunne se ud som om hun sidder og ser ud på samme regnvejr som mig. Og med en god varm kop kaffe- som jeg gør! Mønsterpapiret er fra Little Yellow Bicycle, nogle rigtig flotte ark. Jeg kunne næsten ikke nænne at skære i dem. det er altid de fineste der forsvinder først. Taggen er hjemmelavet, teksten er fra Kort og Godt Hobby. Og se, der er en charm på dette kort. En sød lille mobiltelefon. fra Martha Stewart, og kommet en masse Stickles på. Bagsiden er relativ enkel med elementer fra forsiden. Jeg har brugt Kiki's sketch fra The Sugar Bowl. 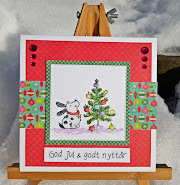 Aud Sentiments Challenge Blog- Happy! but if you have, you'll know why I had to make this card. I have to use all my beautiful small metal things! Simply we'd like to see a charm on your creation. For sponsor information and please take a look here. please visit the ABC Christmas Challenge. I had to play with this Gruffies image. Look at those two, trying to scare each other. in the town we live, I just had to buy them! I have used an old button and some hemp twine. the button, but it didn't look good! So I had to fasten it in the other corner. The ticket stamp is from Whimsy Stamps, stamped on kraft. of course my personal stamp. Let Me Call You Sweetheart, DT card for FFF. Pink/Red/White- Valentines. DT card for DDCC.